Ai Fiori is inside the chic Langham Place hotel. 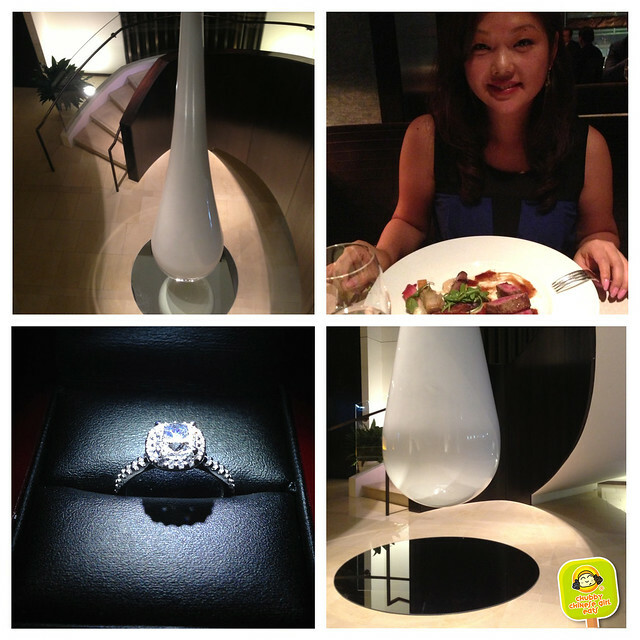 The massive tear drop sculpture hangs beautifully and a spiral staircase leads you to the restaurant. 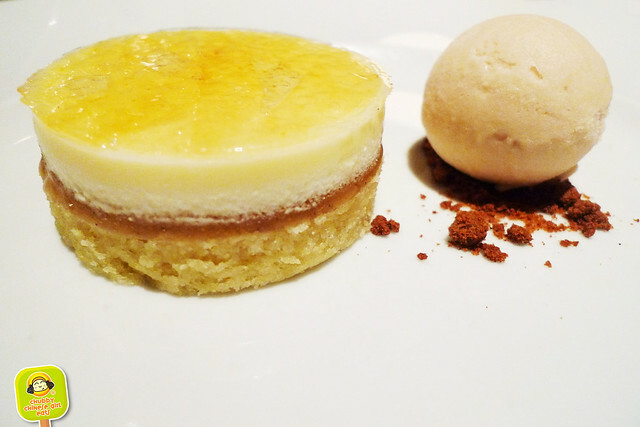 I’m a big fan of Michael White, from Marea to Osteria Morini and Nicoletta. 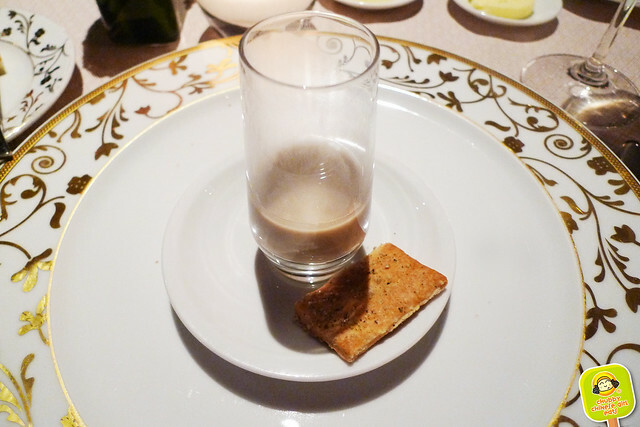 Creamy mushroom soup with an herb and pepper cracker. 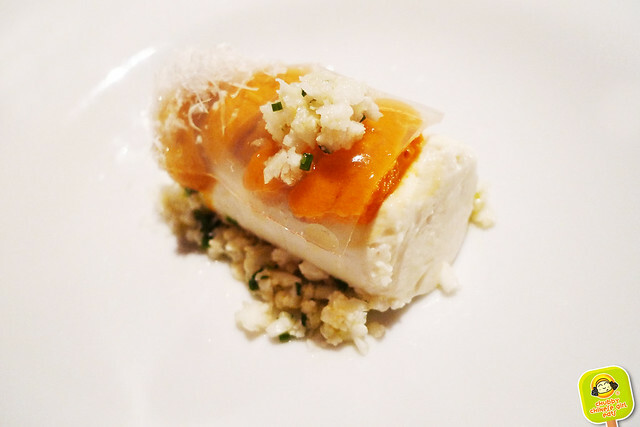 A rich cauliflower panna cotta with sweet sea urchin bright lemon zest and a shaving of salty parmesan. The cauliflower’s subtle aroma plays so nicely with the uni. It melted in my mouth with little pieces of the vegetable adding texture. 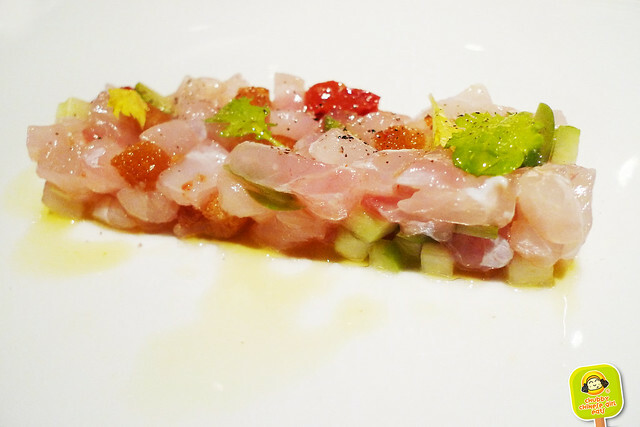 StalkerBoy chose a wild striped bass tartar with toasted bread, olives and cucumber. Refreshing and fresh with a lot of flavor and crunch. We were both excited about this dish. 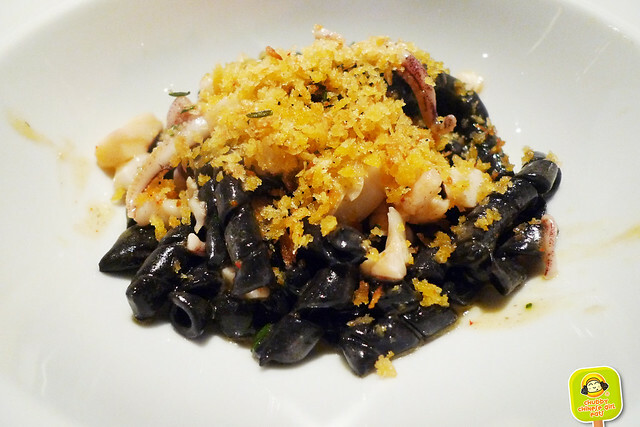 I love chef Bianco’s superb pastas and this squid ink pasta did not disappoint. Umami filled Lingurian crustacean ragu, seppia, scallops flavored the perfectly al dente ribbons of black pasta. Chewy and bouncy. Topped with spiced mollica to give it crunch and a hint of heat. I will come back just for this with a nice glass of wine. I don’t eat pasta often, but when I do, it has to be Michael White’s. It always make me giggle when servers bring over the red meat and think it’s StalkerBoy’s. I’m a carnivore and whenever the choice is between fish and meat, I usually pick the latter. This prime dry aged strip loin was full of flavor. The marbled texture reminded me of some of the beef I had in Japan. 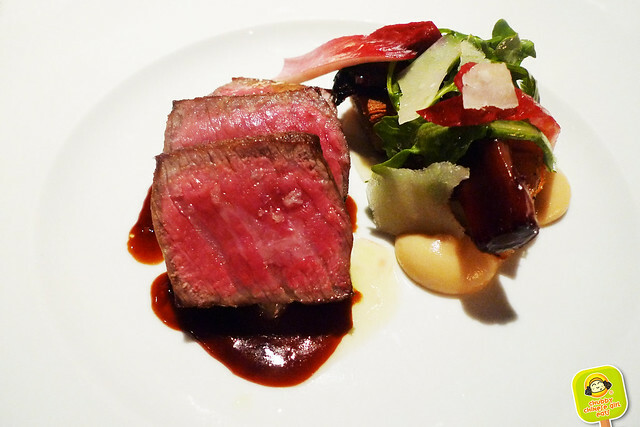 A deep bordelaise sauce, rich and flavorful. So fragrant from the butter. Endive, potato terrine, “cacao e pepe” and balsamico. The fresh bitterness of the endive helped cut the fat with tartness from the vinegar. Thought it’s a heavier entree, it was balanced. The potato terrine was a highlight. 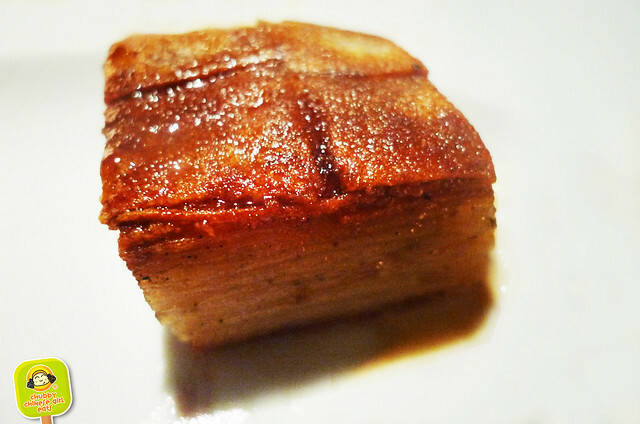 Wonderfully crispy and buttery layers of tender and thin, paper like potato sheets. So good. 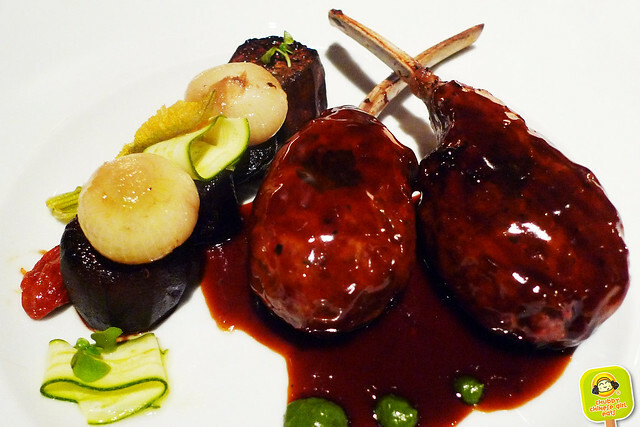 Rack of lamb en crepinette, ratatouille and squash blossoms. I don’t eat lamb but StalkerBoy enjoyed it. 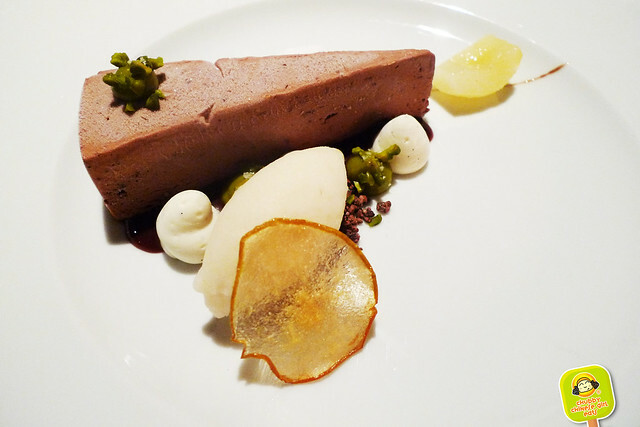 Dark chocolate semifreddo with a light lemon verbena and roasted peach sorbet. Creamy, rich dark chocolate. A little bitter sweet and tart. A bit of pistachios for a crunchy salty touch. My kind of dessert. Ligurian olive oil cake with mascarpone mousse, pistachio and strawberry sorbetto. Light and fluffy. Lovely way to end our meal with a warm cup of chamomile tea. I liked the option of a 4 course meal, we got to try a variety of dishes without being overly stuffed. Can’t wait to be back to relive our special night. Congrats for the proposal. I follow your blog since its debuts and it has helped me finding great places where to go eating. So now I am glad of hearing about such happy moment in your life and the choice of the place is indeed great: Ai Fiori is a perfect place for a proposal Dinner. When my friend proposed at the NoMad hotel restaurant (I helped arrange for them to let him use the gorgeous terrace space), they warned him that it might be easier to do it before dinner before the nerves set in. I guess someone should have warned your fiance! Ha preso un sacco di tempo per leggere, ma ho davvero trovato questo molto interessante e informativo, grazie per la condivisione. I know it’s been years since this post was made but I’m new here so; Hooray!